Leadership, Engagement and Culture are three of the key challenges facing organisations today. Winning in the marketplace as well as winning in the workplace requires a culture of engagement and collaboration. Free To Grow has a wealth of experience and an impressive track record in partnering with organisations to shape and sustain this desired culture. Free To Grow ensures that every person in the organisation is aligned with the strategy and knows exactly what to focus their energy on. We can assist you with strategy analysis, as well as the articulation, alignment and communication and execution thereof. Inspiring and effective leaders are the key to shaping a high engagement culture and driving business results. Through leadership programmes and individual coaching, we support our clients in developing strong and capable leaders. This will empower them to help employees develop and grow, executing the business strategy. Teams across the business that are connected and engaged are fundamental to achieving results. Effective teams comprise individuals who have a strong emotional connection to the organisation, find meaning in their work and are committed to playing their part. Our programmes significantly accelerate individual growth and bring meaning to work. They improve accountability and execution and drive team performance in functional and cross-functional teams. Customer satisfaction is a function of the business consistently delivering on what matters to customers. Our approach ensures that the “voice of customer” is understood and processes are geared to deliver this, team members understand and are competent in their processes and have the mindset and skillset to innovate and continuously improve customer experience. Through engagement research, we’ve identified the key drivers that most impact employee engagement. This provides a useful framework for organisations to ensure that their engagement efforts are structured and comprehensive enough to drive the needle of engagement in a positive direction. Our engagement programmes strengthen the drivers related to leadership, the psychological environment and employee mindset. These programmes are complemented by a range of learning programmes developing various aspects of individual and team competence. The five critical stakeholders in creating a culture of engagement are senior leaders, managers, supervisors & team leaders, individual employees and HR. Our range of employee engagement programmes equip each stakeholder for its specific role while creating a common language regarding engagement in the organisation. Equip and support the organisation’s leaders with the mindset and skillset to drive engagement. Shape a compelling story that will align the organisation behind a common purpose and vision. Communication: Creating dialogue and encouraging employee voice about what matters to them and to the organisation. Engaging Leadership can be bolstered by TeamConnect – a powerful methodology used by leaders of teams to ensure that teams execute their work. It makes use of structured team meetings as well as coaching and mentoring on the job. WorkQ goes beyond IQ and EQ to develop the mindset, knowledge and skills that enable non-management employees to understand the needs of the organisation, make them aware of what is expected from them to sustain and grow the organisation and be more willing, eager and able to contribute their best and effectively support each other in the process. Service Journey: An optional module that equips employees with the motivation, knowledge and skills to deliver an outstanding customer experience. This programme helps them understand Employee Engagement and equips them with the skills and tools to create a positive work environment and developing the 2 I’s critical to their role: Inspire and Interact. 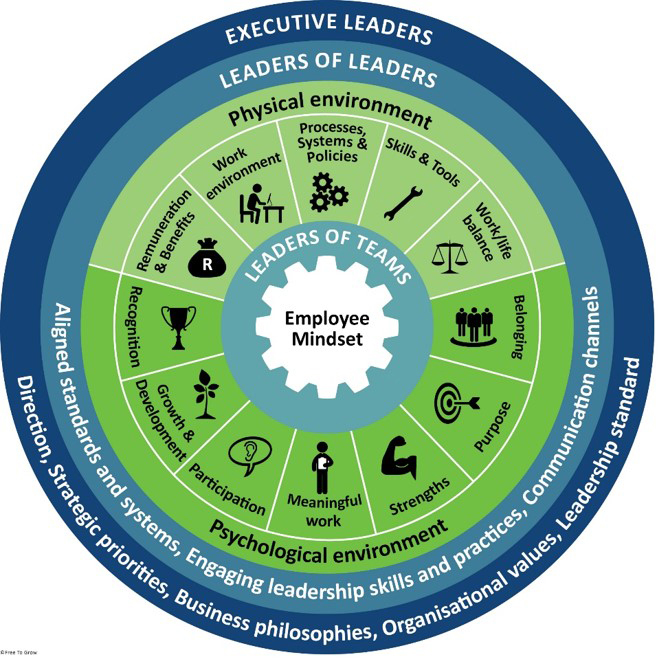 It follows the same themes as Engaging Leadership, aimed at managers so that a common language regarding Employee Engagement is created across leadership levels in the organisation. LeadQ is complemented by punchy monthly or bi-monthly, half day LeadQ Coaching Circles that continue to develop engaging skills in digestible chunks. businesses to their customers and suppliers. Once connected, the focus is on engaging everyone to achieve their common goals through effective teamwork, functionally and cross-functionally. TeamConnect® makes use of structured team meetings as well as coaching and mentoring on the job. Ensures leaders themselves are aligned with the vision and speak with one voice as far as the change and what it requires from people is concerned. Communicate the new vision to employees so they understand it, can see where they contribute and aware of the role that they need to play to ensure that the change is successful. Motivate, Inspire and influence employees with their own example, and energise them to exert themselves to make the change happen. Engage staff in meaningful dialogue about the change, encourage them to raise concerns regarding the change and together search for solutions that will address the challenges. Sustain change in the long term, embedding it to ensure that it ‘sticks’. Helps them better understand their role, and how they need to contribute personally to make the changes facing their organisation successful. Delivering exceptional service is much more than serving customers – it is a mindset, a conscious commitment. This mindset and commitment are directly related to employee engagement. The reason? Engagement – the emotional commitment one has to your organisation and its goals – drives higher levels of discretionary effort. Purpose: Helps employees understand the organisation’s vision and the role of customer service in achieving this. Picture: Opens a new window and grows their understanding of the bigger organisational picture. Part: Helps them understand the part they need to play in achieving this. Passion: Grows passion for their work, their customers and delivers service excellence. Equipping HR and all levels of leaders with skills and tools to walk the engagement talk, lead by example and bringing meaning to work & creating a culture of collaboration. We also equip leaders to facilitate meaningful, structured team dialogue to strengthen the culture (values) & improve team performance. Programmes include HRengage, SHAPE, Engaging Leadership, LeadQ and TeamConnect. In a change management context, our Leading Change and Change@Work (Change Champions) programmes equip formal and informal leaders to drive and lead the change. Strengthening the confidence & connection of employees and their first line leaders with the organisation. Building basic business acumen gearing them for optimal contribution. Tools include: WorkQ, TeamConnect coaching, training internal coaches & an App for leaders. 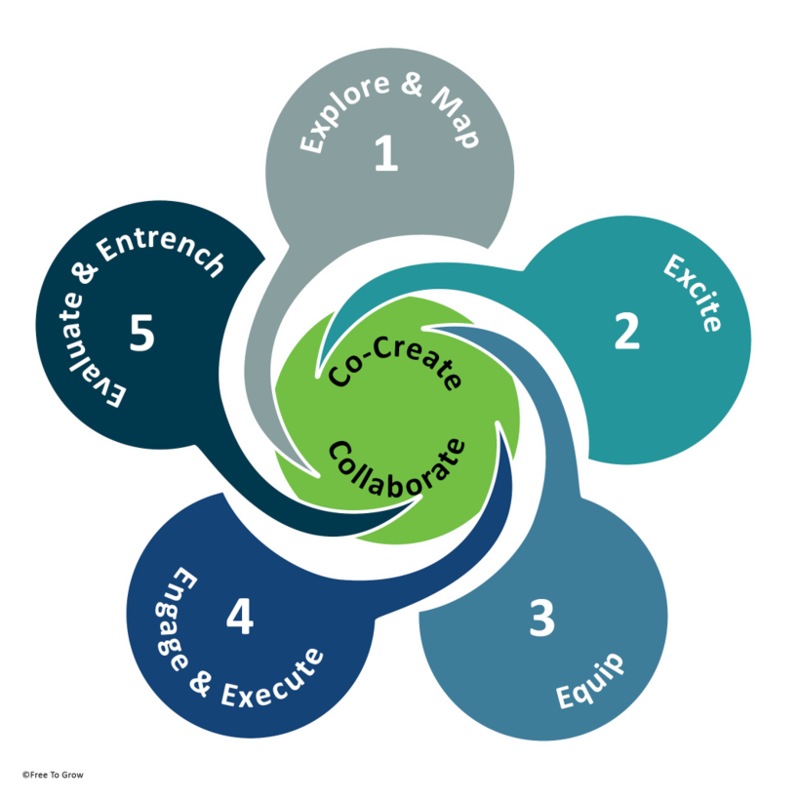 In a change management context Fit 4 Change brings employees ‘on board’…. Measuring ROI throughout the process by dipstick measurements, analysing business metrics & progress reviews Embedding and supporting the learning through support guides, coaching circles, individual coaching, capacity building programmes, systems integration, learning bytes & the TeamConnect® app. The saying, ‘What gets measured, gets done’, also applies to Employee Engagement. When performed effectively, Employee Engagement Surveys perform a vital ‘health check’ in the organisation and hold numerous benefits to the business. Focusses on key Engagement Drivers instead of a long list of nice to knows. NOW WHAT? Linked to Free To Grow Drivers of Engagement Model, enabling us to easily integrate the trends into our Employee Engagement programmes. Available in electronic/mobile and/or hardcopy. “The survey gave employees on shop-floor a voice. It helped us to uncover engagement levels and provided us with valuable insights.